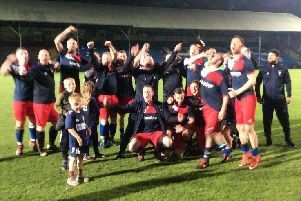 SOWERBY BRIDGE booked a second final appearance in four days yesterday when they beat Brighouse Sports 3-0 in the Halifax AFL’s Jack Haymer Challenge Cup at Greetland. They were too strong for their division-lower opponents in windy, cold conditions at Goldfields. Bridge took the lead midway through the first half when Luke Maguire was bundled over following a great pass from Martin Bates and scored from the penalty spot. Maguire doubled the lead before half time and Damian Watkins added a third. Bridge’s Jordan Bolton had just one save of note to make as Ryan Brook and Kai Hadley dominated matters in central defence. The side managed by Chris Punda will play the winners of next Saturday’s game between Greetland and Shelf FC at Luddenden Foot. Bridge had won through to the West Riding Trophy final - and a possible date with Ovenden West Riding - when they crushed Honley 6-1 at the County FA’s headquarters in Woodlesford on Wednesday. Club spokesman Mick Ellis said the big pitch in Leeds had suited them and they had run away with the contest after Martin Bates had made a crucial goal-saving tackle when they led only 2-1. Lee Wood had been in particularly good form. Ellis said the Bridge players were keen to win trophies in memory of club stalwart Dave Culpan, who died last year. With a lengthy gap likely before the cup finals, Bridge can have a crack at trying to put pressure on runaway leaders Ryburn United in the race for the Halifax AFL title. Bridge have nine Premier Division games left and travel to play Ryburn next Saturday. Before then they host bang in-form Hebden Royd Red Star at Carr Green on Wednesday.